The best mystery writers tell succinct stories that feature fast-moving, suspenseful plots—qualities that writers in other genres sometimes fail to achieve. P.D. James once observed that readership of crime novels increases during anxious times, because these stories feature heroes who fight to protect the world from evil. This current surge of white-collar crime, financial crisis, and job uncertainty could be good news for John Locke. 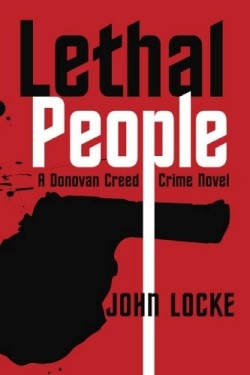 His crime novel, Lethal People, introduces a projected series featuring Donovan Creed. Formerly a CIA assassin and presently engaged in top-secret assignments from Homeland Security, Creed also moonlights as a hit man. Killing for hire keeps his adrenaline primed and provides extra cash to satisfy his taste for first-class hotels, fancy restaurants, and expensive women. Despite his tough exterior, inside the man lies a soul that yearns to love and be loved in return. Midway through the book, Creed meets a young woman he plans to use as a body double for his heartless but highly effective blonde assistant, Callie. “Of course, our body doubles are totally clueless about their participation in our reindeer games of national security. If they knew about it, most civilians would disapprove of the practice,” Creed explains. The plot moves forward with violent twists that will satisfy readers looking for fast action. Strategically placed clues predict future events without compromising the surprise factor. Well-defined characters embody the complex dynamics of good and evil. The book’s black humor may seem harsh to some but will elicit laughs from readers who get it. Several deaths as the book concludes will seem inexplicable to less observant readers, but careful review of the text reveals a logical motive for these revenge killings. This book will please those looking to escape into a story that keeps them guessing until the end.